How are you all?? Well I am fine and Happy Because Finally I got rid of my braces. That is why I was little absent from here. Now I am back and Going to review my recent favourite product I have been using currently. 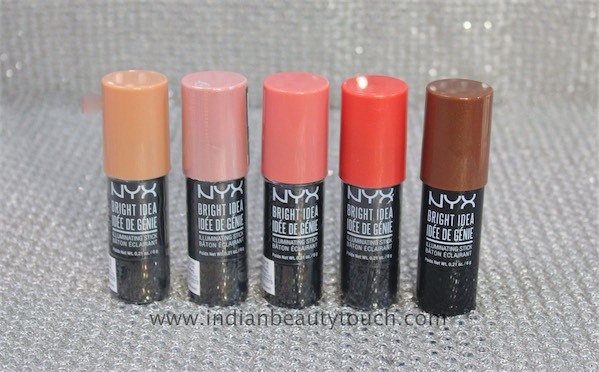 And That is NYX Professional Bright Idea Illuminating Sticks. It was sent to me by NYX India But My review is completely honest. I have been using these sticks from November. And I would say I am quite impressed with this product.So let me just give you all a quick review on them. 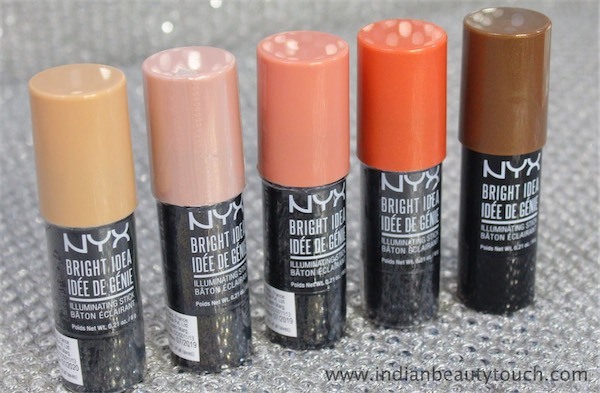 Brighten things up with NYX Professional Makeup's Bright Idea Illuminating Sticks! Available in a range of radiating hues--including four highlighters, four blushes and four bronzers.Each creamy-soft shade goes on smoothly and sets right away for an instant, lit-from-within glow. 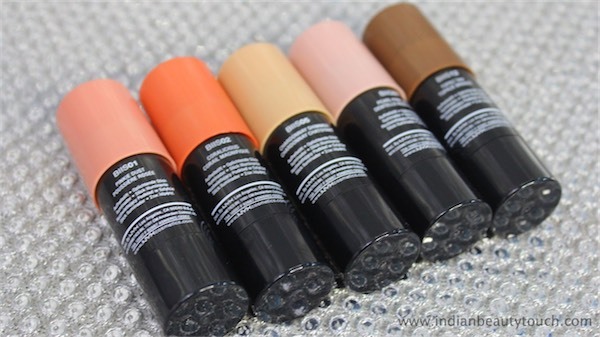 Complexion brightening sticks in creamy, soft texture. Multi-talented brightener also comes in bronzer and blush shades. Petite, portable and perfect for strobing, it's the makeup must-have of the season. Start with Packaging, It comes in a jumbo pencil in size of hand palm. The color can be visible through caps. These small pencils can be twist from bottom if you finish the product from top. 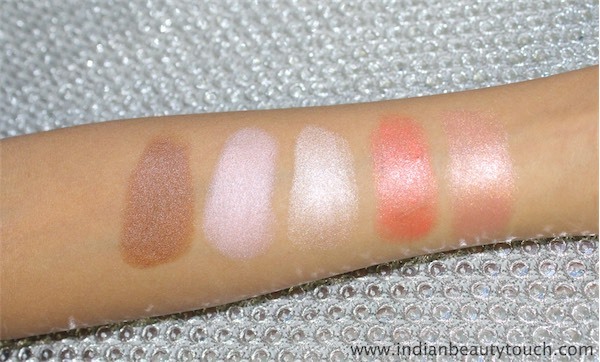 I got five different shade which includes Pinkie Dust, Coralicious, Chardonnay Shimmer, Pearl Pink Lace, Topaz tan. 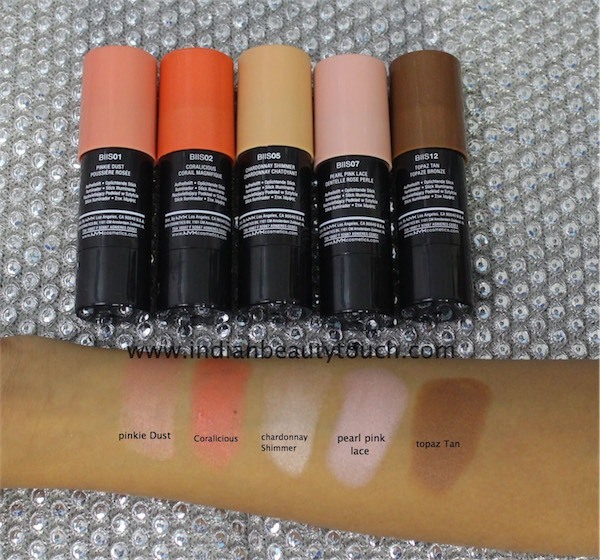 All shades are really beautiful and very easy to use. The texture is creamy But believe me once It Blends, It doesn't feel sticky or glossy on skin. These are illuminating sticks. You can use them as highlighter or can apply with foundations. Pigmentation is really good. It was just one swipe in pics and You can see how gorgeous these color look. They don't have any kind of smell. These Bright Idea Illuminating Sticks have shimmer in it but also have larger chunks of glitter. My Favourite colour is Coralicious. I love to use this color as blush which gives me a healthy/Natural rosy cheeks and also gives very beautiful glow on my face. This is my everyday product now. It stays very well on my face as I once wore this in gym while I was doing heavy workout and still it stays on my face after all the workout. So Yes, That makes it a really good product. As I have very sweaty skin. So thats it. 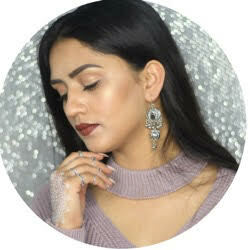 I hope You will find this review helpful and I will share face swatches very soon Till then keep spreading love.